It is not uncommon for companies to branch out and utilize alternative methods for advertising and promotion when the usual routes to publicity have been mined. Who would have made the connection between Shaving Cream and clandestine assassins? Well, Ubisoft of course. As of late the game developer has been exploring unorthodox marketing methods, from the aforementioned shaving cream connection with Edge and Assassin’s Creed, to a mural painted during FanExpo. 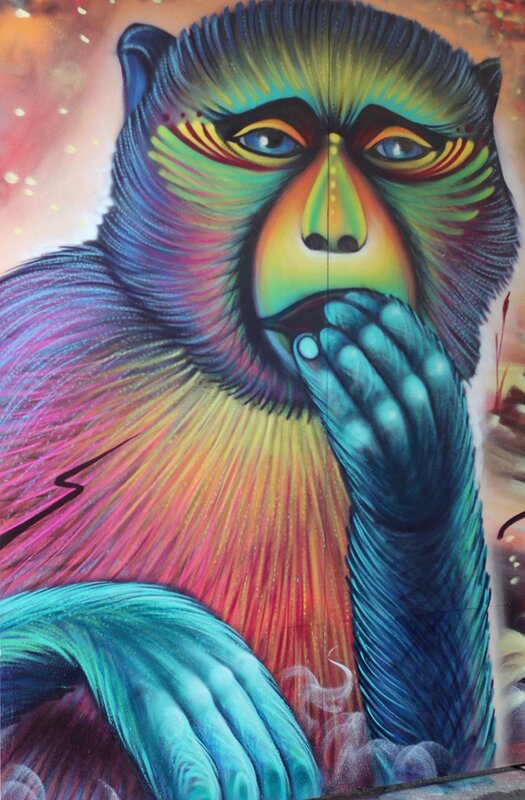 Their most recent attempt to conduct multi-disciplinary marketing has been to enlist the help of an elite team of street muralists, lead by vibrant hand Nick Sweetman. 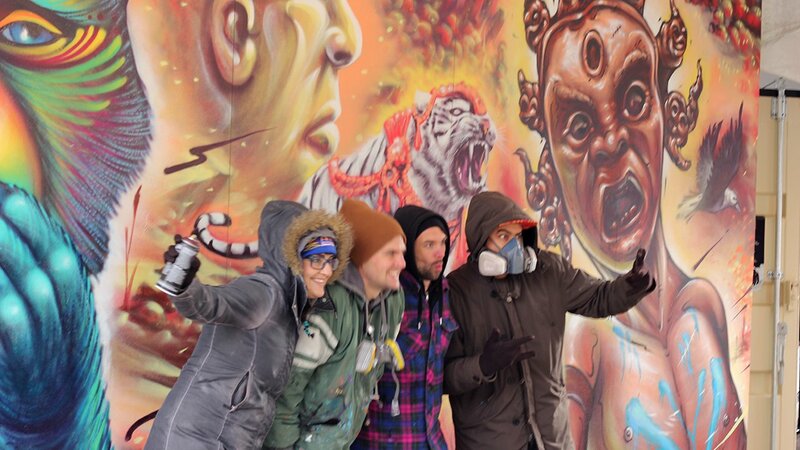 The team of street artists descended upon their canvas about a block away from the Eaton Centre in downtown Toronto and emerged two days later having completed a mural showing a panoply of Himalayan iconography in fluorescent colours and dazzling technique. 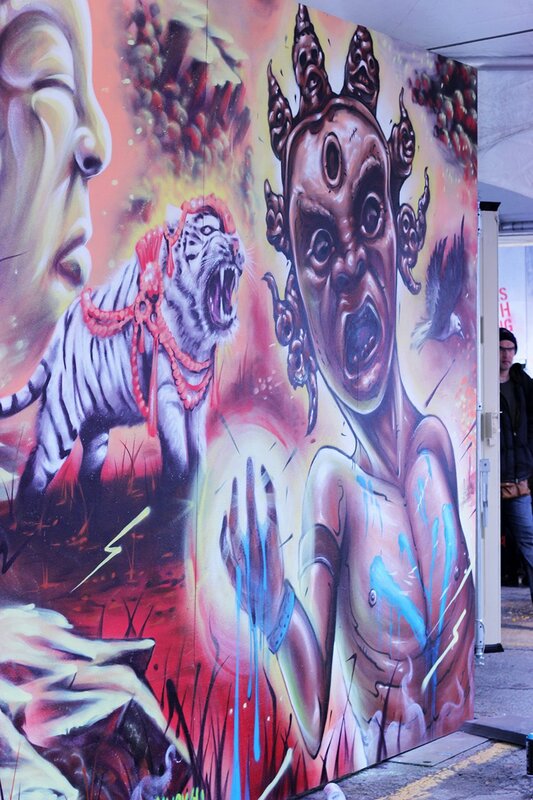 Mixing a variety of styles into one coherent piece is always a challenge, but the artists merged together and complemented each other’s approach and arrived at an eclectic composition including a decorated tiger situated in the center of the piece; a symbolic animal with religious significance in many cultures. Working closely with Ubisoft, the team of artists arrived at a blueprint for the piece incorporating elements from the latest addition to the Far Cry franchise which takes place in the fictional land of Kyrat located in the Himalayas. CGM spoke with Nick Sweetman about the project. Comics Gaming Magazine: Could explain your background and how you got involved in this project? Nick Sweetman: I’m an artist; a multi-disciplinary artist. I do murals, I make work in a studio, paintings mostly and mixed media. I just finished my MFA from OCAD and this has been something we’ve had on the go for a while. CGM: How did you get involved with this then? NS: It’s who you know. My good friend Paul works for NorthPR company that manages the Toronto side of Ubisoft, and he basically presented me as the person to do this. He said talk to some other artists that you want to work with, so I assembled this crew. The project has gone through a few changes. First it was me and three of whoever I want, then it was me and one other person and then it was just me, but I love these guys and I wanted to work with them so I’m going to bring everyone. I told them you don’t have to pay us differently; we’ll just split the payment because I don’t want to kick them off. CGMagazine: And who are the other people you’re working with? NS: Shellac Attack, Bruno Smoky and Jeff Blackburn. CGMagazine: And how did the overall visual concept come together? NS: It came from the art director. He provided us with the building blocks, and then the idea was, given the story, how are we going to tell it. You know, put our own kind of flair and spin on it, and what are the elements that we want to focus on and present to the public to whet the appetite for the game. 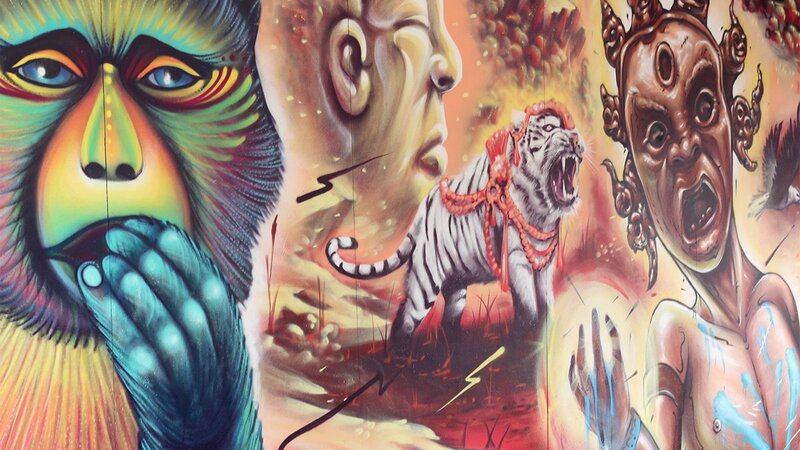 We had to do a bit of research into the game and they have this alternate universe called Shangri-La where your warrior fights alongside a white tiger, and I was like that has to be in the mural. And then they showed us some of the enemies and we thought it would be cool, because their thing is crazy as FC4, so we wanted it to be scary; we wanted it to be startling to look at. So Bruno, that’s his thing. He does, not evil, but really twisted stuff; so he was on that. And then Shellac is so good at bringing that splash of colour and doing furry animals. Jeff and I are not at their level, they are just pros, but Jeff and I held our own. I did the tiger and he killed it on the background, and it just fell into place really organically. Everybody just picked up their portion. CGM: So did everyone have a specific part of the mural they worked on or did you all work together? NS: It’s tough to work on a wall this small with four people actually. Someone has to be on a ladder and someone has to be painting below the ladder, but it just kind of fell into place. Like I said, they do this kind of thing all over the world every single day. So we kind of looked to them to get things started, and once things were rolling it becomes intuitive. In terms of design, that was put together by Smoky. I had my show and it was impossible for me to spend anytime on anything else, so I was really lucky that Smoky stepped up and put together the design because they loved it. Basically we were told don’t feel to tied to these images, we want to see your interpretation. That was really nice. For them to say we want to see your voice, that was really cool. CGM: Did they have final say over the design? NS: Yep, they had to approve of the design. And what they said was this is a little too close to what we already have in terms of concept art, so we’d really like you guys to make it more personalized. So if you look at the lightning bolts, that drippy stuff, that’s very Smoky. This is very Shellac. CGM: Who did the tiger? NS: I did the tiger. I guess it’s very me [laughs], I’m not able to tell my own style that well. We wanted to bring a very lively energy, so we got the lightning bolts, there’s a lot of motion and a lot of splatter, because if you look at the branding of this game it’s all holy powder, you know. It’s all just air-borne colour particles, like it looks so beautiful and vibrant. So we were really excited to use those pieces we were given and assemble them in our own way. CGM: Why did you choose this particular visual style? Because you have a comic style and then a very realistic style with the tiger? NS: I think that’s the awesome thing about working with different people. Like these two, Smoky and Shellac, have such a strong voice artistically because they’ve been doing this for so long. They are very active in Toronto and you’ll be able to pick out their work just from seeing this. So Smoky really has that comic look and Shellac is always very colourful and has a kind of symmetrical style. She can probably describe it better. I wish I wasn’t having to speak for everyone, but to answer your question it wasn’t a choice. It couldn’t be any other way because everyone works on it their own way, and it would have been so weird to be like I’ll do the legs of the tiger and you do the head or something. You kind of have to divide up the elements and then once it’s all done, this is how we’ve worked on murals before, you look at it together and figure out how to weave the styles into each other. CGM: So how do you think this all turned out? Is this what you were envisioning? NS: Yea! More or less. I’m very happy with it. I think I challenged myself and succeeded in what I tried t do, and I got to work with artists who I love and admire. CGM: And how long did it take you? NS: We did about three hours yesterday and three today. CGM: So six hours total? NS: Yea. They are very fast. But it was a lot of fun. Everyone is so friendly. The experience overall was just a pleasure, other than the cold obviously. CGM: The cold just kind of randomly came upon us. NS: Yea. It’s tough to paint in the cold. I won’t lie, it’s definitely preferable in warmer weather.